I find it appropriate that my inaugural post will hit the airwaves on the day of my mom’s birth. Her love of the written word, passion for history, and zest for learning have played such a significant role in the development of my own habits that it only seems fitting for the celebration of her special day to be marked by the launch of this blog. The words that will henceforth flow from me are rooted in an upbringing filled with love and compassion from her joyful heart and shaped by the exploration of knowledge she modeled. Herein lies my quest to wander back to myself. Over the last three years, I’ve swiftly tumbled into the lair of motherhood. For nine months I watched my body take new shape, buried myself in books on childbirth, learned every detail of what to expect each month of this new journey, and bore witness to how many of those expectations came true as I danced through the first two years of my son’s life. Every stumble, every pothole, every bump in the road of motherhood has all wound back to one reality: his pure, soft, innocent face brings peace to my heart. As all new moms, I’ve struggled and stressed and stayed up late at night, checking to be sure he’s still breathing. I’ve been flustered and frustrated and almost in tears when he wriggles out of his boots and refuses to put his mittens back on. I’ve stepped on toy cars, forgotten to dry laundry as it sat in the washer for days, and fed him macaroni and cheese from a box on many occasions. But at the end of the day, I’ve always felt at home as a mom. My world for almost three years has been all about him. And somewhere along the way of worrying whether I remembered to rinse the cloth diapers, clocking every morsel of food that went into his mouth, and turning over all my spare money to the expenses of daycare and baby supplies, I lost my balance. I lost a piece of myself. My jeans don’t fit quite like they used to, and let’s not even discuss what breastfeeding does to a woman’s round, firm…well, anyway, when I look in the mirror, I sometimes don’t know who I see. But even more disconcerting is the inner being. The essence of all I loved and craved slowly drained from me. In its place has stood an amazing new structure of a woman, a mother, a confident provider, and, yet, a piece of her is still out of focus. Who is she beyond that nurturing caregiver? Where does she exist when the lunch is packed and the baby’s strapped safely into the carseat? Can she sweep this new persona aside, even in short stints, to bring back a morsel of her old being? Well, we’re here to find out. Join me as I journey back into the future of myself. Much like the waves lapping the shoreline, this quest will be cyclical. By swaying back to what used to make my heart leap and flowing forward into finding new passions that fit my lifestyle, I will meld my many selves to be a stronger mother, a stronger partner, a stronger friend, daughter, sister, neighbor, and, most importantly, a stronger version of myself. I’ve been on this road for many moons but am only now plotting the course and logging my coordinates. Within the walls of this blog, I plan to catalog my thoughts, spell out my struggles, and regain balance. Throughout 2013, I will be assigning myself challenges to carry out, all of which are inspired by an ingredient of the old me. By focusing on one link at a time, I will slowly and systematically reform the chain, hopefully adding new and even unexpected links. So walk beside me, inspire me, inform me, grow with me, and get to know me – past, future, and, of course, present. 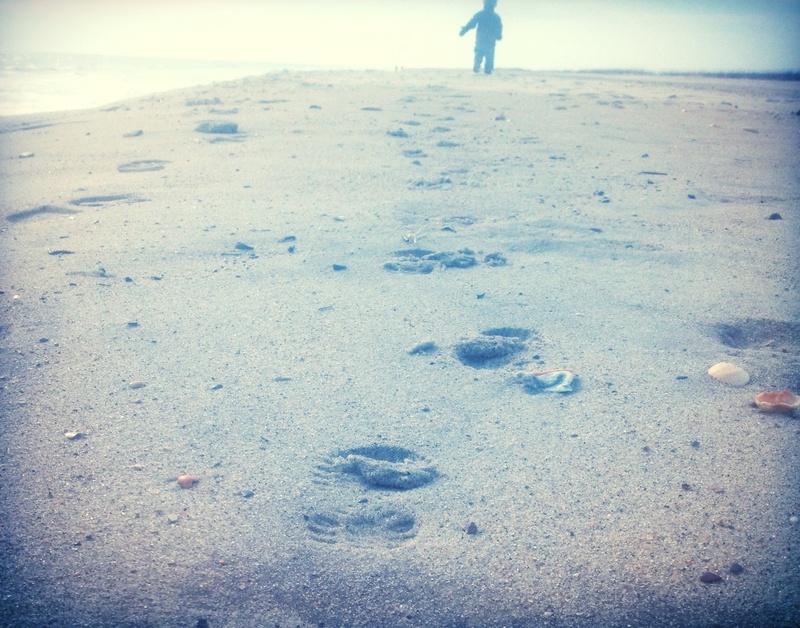 This entry was posted in Reflections and tagged motherhood, personal growth, self reflection. Bookmark the permalink. Aww, Lori. Your comment made me cry. Thank you so much. I, too, wish we lived closer so we could delight in Emmett’s growth together. We will just have to do our best to rendezvous at the prime location for all little ones, the lake. After all, “Itsuitsus”! I know we didn’t get to spend much time getting to know each other when you were in town…..but I GET this. I had Jordyn when I was 19, and while there isn’t a day that goes by that I don’t rejoice in what she has brought to my life there have been many occasions where I’ve felt like there wasn’t room for “me” in my life anymore. I would go out on dates with people and they’d ask the standard “what are your hobbies/interests”, and I would answer “reading” or “running” or “playing music” and then think to myself – I haven’t done any of those things in years! What I’ve come to believe in the 10 years I’ve been a mom is that you have to lose yourself – in the beginning – at least a little – to be a good one. But you have to reconnect with yourself – at least a little – to continue being a good one. If you don’t take time for “you”, and your relationships, when your kid(s) leave the nest there will be nothing but shells and ghosts left behind. If you don’t continue to learn and grow, what could you possibly have to offer your children? I think what you’re doing is fantastic, and I wish you loads of luck and send you good vibes! Erin, thanks so much for your words. What you said is so spot-on with my experience. When Emmett was still pretty young I contemplated how to get those pieces of myself back. I knew where I wanted to be, but I found that as a new mom it’s quite difficult to get there without giving up a piece of the amazing new journey of motherhood. So I backed off and gave myself space to just embrace the loss of me and the transformation into being a mom. And I wouldn’t trade it for anything. Now I feel ready to start replacing small pieces of myself, because, as you said, we can’t be good moms if we’re aren’t being – or at least trying to be – a version of our best selves.